Fastweb has the answers to students' most frequently asked questions about scholarships. How do you get a scholarship? While we're the experts on serving up scholarships, it's really up to you, as a student, to take it to the next level. What do we mean by that? Fastweb is basically a scholarship middle man. We find the opportunities. Then, our research team checks them out to make sure they are legitimate opportunities. Once we've determined that a scholarship is legitimate, we add it to the Fastweb database, which includes millions of scholarship opportunities. At that point, we match students (that's you) based on their Fastweb profiles. Once students are matched to a scholarship via Fastweb, it is up to the individual student to follow through and apply for the scholarship. It's important to remember that applying for scholarships is a numbers game. The more you apply to, the better your chances of winning. Unfortunately, it's difficult at times to win a scholarship, and not everyone is guaranteed to win one. But people really do win scholarships through our site, and our Wall of Fame proves it highlighting some (but definitely not all) of our scholarship winners. What is a scholarship for college? A scholarship is an award offered to students to help pay for college tuition and, potentially, other college expenses. Students who meet a specific scholarship's criteria are able to apply for the award and are chosen based on the criteria set, whether it be merit, an essay or some other requirement outlined within the scholarship provider's details. What are the requirements to get a scholarship? The requirements of a scholarship are entirely up to the scholarship provider. Scholarships are often limited by GPA, citizenship, gender, age, race or field of study. To find out if you meet the specific requirements of a scholarship, click on the scholarship title within your matches and you will be taken to a scholarship details page. There, we've outlined the criteria provided by each scholarship provider to help you determine whether or not you qualify for the scholarship. How do you apply for a scholarship? When you see a scholarship that interests you on Fastweb within your scholarship matches, click on the title of the scholarship. From there, you'll be directed to a page detailing the scholarship's requirements. If you determine that you do, in fact, want to apply for the scholarship, click through to the scholarship provider's website and follow the instructions within their site to continue on to apply. How does a scholarship work? It's no secret that college is expensive. Scholarships are provided to students to help combat that very issue. 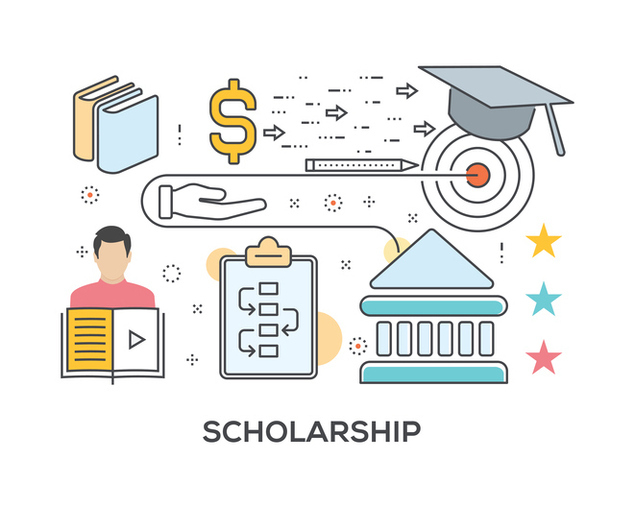 Scholarship providers generously offer students the opportunity to get help paying for school by earning awards to put towards tuition and, in some cases, other college expenses. So, how does it actually work in terms of applying? Usually that depends on the scholarship. For example, some scholarships are fairly straightforward and just require students to sign up or share their program. This is most common in promotional awards and such scholarship opportunities are often included within Fastweb's Featured Scholarships section. Others may require something unique, like essays, social media shares or other outlined tasks. Once you win a scholarship, the scholarship provider will be able to give you details as to when the scholarship is applicable. For example, some scholarships outline that they are applicable the semester following the scholarship win. Others allow students to determine when to use the funding they've earned. If, for some reason, a scholarship does expire, the scholarship provider will provide you with the information upon winning or outline the details of use within the information provided. Scholarship listings, however, do expire in a sense. Most scholarships have deadlines which students must meet in order to qualify to win the scholarship. You can find a convenient list of upcoming deadlines for your scholarship matches on Fastweb.